Here's a layout that was up on the 3 Birds Studio blog using the Graceful Season collection, and a bit of the brand new Midday Medley collection too. I love that the two mix and match together so well!! I had already started putting my layout together when the new Midday Medley goodies arrived in the mail. As soon as I realized how well they coordinated, I thought why not add some of the new things to my layout! So the papers are Graceful Season, and the yellow oval sticker and the cute Today stamp are part of the new Midday Medley collection. I also used this FREE Stars Background cut file designed by Juliana Michaels, behind my photos, and did a little water coloring and a few paint splatters too. Very nice layout ! Love this watercolor blue ! Looks very pretty, I like the colours. I love what you did with the watercolors! I don't take on many mixed media techniques; but when they look as nice as yours, I'm tempted. TFS! Beautiful page, watercolor seems to be big now so it's nice to see it emerging into sb pages. Wonderful layout! 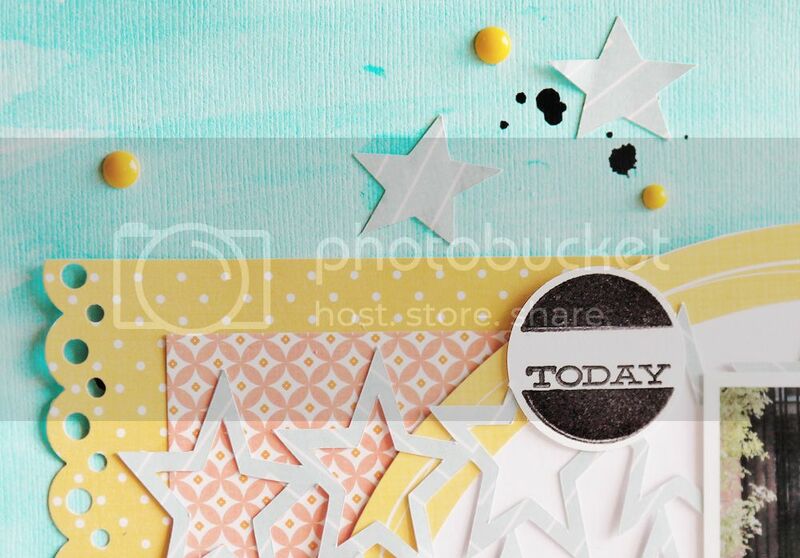 Loving the background and that great die cut overlay! what a cool page! i pinned it for later inspiration! awesome! This is gorgeous! Love the background you created! Wonderful layers! The paint and the splatter are terrific with this page! Beautiful Mary Ann! I love the soft water color in the background with the contrast of the dark title letters!! The background is beautiful! It really picks up the aqua in the photos!